Songs of Eretz Poetry Review: New Poem: "Forklift"
"Forklift" is the latest installment in my poetic memoir, A Wave of Poetry. 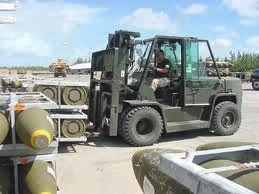 Our forklift was the envy of the Indonesians, who did not have one. Its use allowed the TALCE to load and offload aircraft with amazing speed. One day, while we were waiting for the Navy to pick us up, SrA Bennett taught me how to operate the thing. So, I have another useful skill in case this poet/physician gig doesn't work out.